Agreement on Advance Peace pilot program. Dozens of community members joined City of Sacramento leaders today to sign on to supporting a grass roots approach to re-directing high-risk young men away from a life of crime. Mayor Darrell Steinberg and Advance Peace Board President Chet Hewitt, Vice Mayor Rick Jennings, and Councilmembers Larry Carr and Jay Schenirer, joined other councilmembers and members of the Gang Prevention and Intervention Task Force and other community members to sign a statement of support for the pilot.Sacramento will be the first city in the nation to implement a pilot program operated by the Advance Peace organization. “Today is an important commitment and step in our efforts to compassionately and effectively find ways to reduce gun violence in Sacramento,” said Sacramento Mayor Darrell Steinberg. “The Advance Peace program will help us fill a gap and serve a population for which we have had difficulties reaching. Our goal is to save lives and create a safer community for all residents in Sacramento,” commented Vice Mayor Rick Jennings, chair of the Gang Prevention and Intervention Task Force. “Countless cities have addressed this issue over the decades. It is patently obvious that we are not going to arrest our way out of gang shootings. Advanced Peace offers an innovative approach to helping would-be violent individuals choose a different path,” said Councilmember Larry Carr. “The conversations to bring Advance Peace to Sacramento stem from the very communities where gun violence is occurring on an all too frequent basis. I thank the Mayor and Council for turning those conversations into action today by endorsing this innovative pilot program,” said City Manager Howard Chan. The pilot program will begin ramping up immediately. Participants also known as “fellows” will be enrolled by spring of 2018. 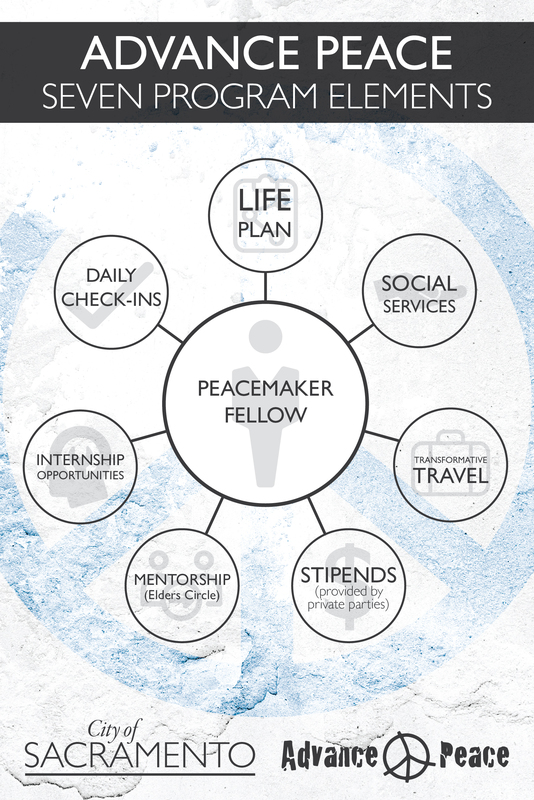 Over the course of four years, two groups of some 50 young men will be identified and approached by members of their community to sign on to be Advance Peace fellows. The Advance Peace organization has committed to a reduction of 20-25 percent in gun violence by the completion of the program by the first group of participants. At the City’s Gang Prevention Summit in Sacramento earlier this year, the CEO and Founder DeVone Boggan spoke to over 250 service providers and received strong support to bring the program to Sacramento. The Mayor’s Gang Prevention and Intervention Task Force, under the leadership of Vice Mayor Rick Jennings, vetted and endorsed the program in February hoping to demonstrate similar results in Sacramento. The City Council unanimously passed the resolution to negotiate an agreement with Advance Peace on Aug. 29. The City is committing $1.5 million over four years. 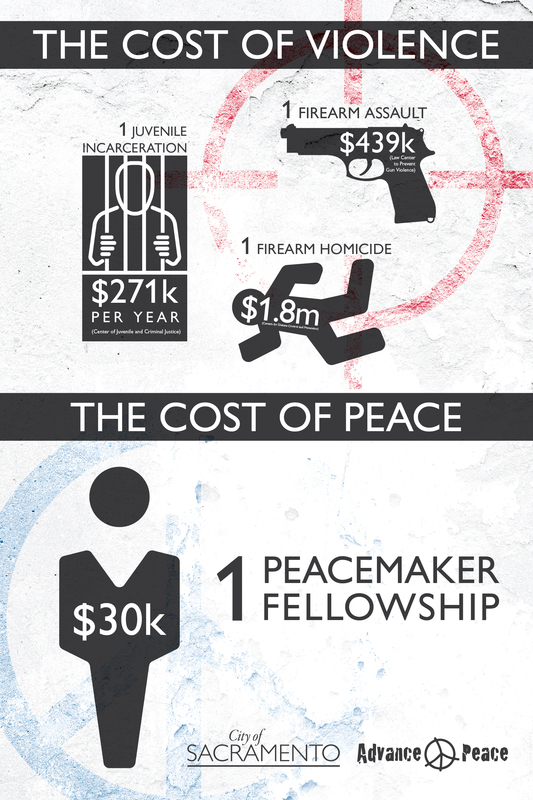 The money is being matched by private foundations that support Advance Peace’s effort to replicate the program in other cities. Each participant is provided an opportunity to earn a stipend per month and take advantage of other social services for 9-months of the 18-month fellowship. The funds used for the stipends are provided through private foundation dollars not City taxpayer dollars. The participants can earn the resource only as a result of intensive engagement and accomplishment of personal goals. Goals may include addressing drug or alcohol abuse, getting a high school diploma or improving parenting skills. The Sacramento Police Department supports measures that address gun violence.